Grover’s Corners beckons! 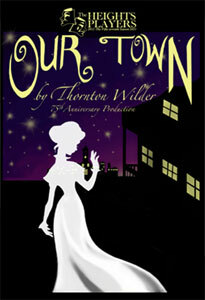 The Heights Players will open Thornton Wilder’s classic Our Town Friday evening at 8:00 at 26 Willow Place; there will also be performances at 8:00 p.m. Saturday and 2:00 p.m. Sunday. The show will run through the following two weekends, with the final performance Sunday, March 17. More details are here. The Heights Players will also be holding auditions for their May production of A Chorus Line on Monday and Tuesday, March 4 and 5, starting at 7:00 p.m. Details are here. Brooklyn Heights Cinema, 70 Henry Street (corner of Orange) will be showing Silver Linings Playbook, for which Jennifer Lawrence won the best actress Oscar, and Quartet, with Maggie Smith. Showtimes are here. Bargemusic has three “Masterworks” concerts on tap. Friday evening at 8:00 there will be solo piano works by Ravel and Schubert. On Saturday evening at 8:00 and Sunday afternoon at 2:00 there will be piano, cello, and violin trio works by Beethoven, Schumann, Kreisler, and Mendelssohn. Saturday afternoon at 3:00 (doors open at 2:30; seating is first come, first served) there is a free, family oriented “Music in Motion” concert. More information is here. Saturday afternoon at 3:00 the Brooklyn Historical Society, 128 Pierrepont Street (corner of Clinton) will present a talk by Robin Schulman, author of Eat the City: A Tale of the Fishers, Foragers, Butchers, Farmers, Poultry Minders, Sugar Refiners, Cane Cutters, Beekepers, Winemakers, and Brewers Who Built New York. Ms. Schulman will focus on the brewers at this event, and will be joined by K. Jacob Ruppert, of the brewing family who were pre-Steinbrenner owners of the Yankees, and Robin Ottaway, Vice President of the Brooklyn Brewery, whose brews will be served at the event. For more information, and to RSVP, see here (scroll down to March 2). Don’t forget Theater 2020’s Ein Heldenleben!, featuring heroic tenor Marc Deaton, on Saturday; and your last shot at Plymouth Church’s Underground Thrift Shop this Sunday. Saw this show last night; it was perfectly staged and performed and I really enjoyed it. A great execution of n American theater classic.